Select an option NO Choker, BAR ONLY 11-12" 12-13" 13-14" 14-15"
Please leave your engraving request here. 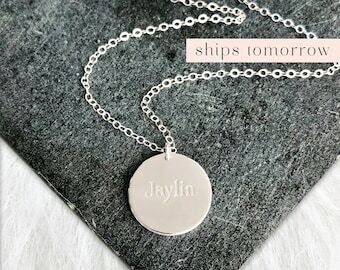 Pay attention to uppercase vs lowercase letters as we will engrave what you type here. Leave an email you check in case we have questions with your order. 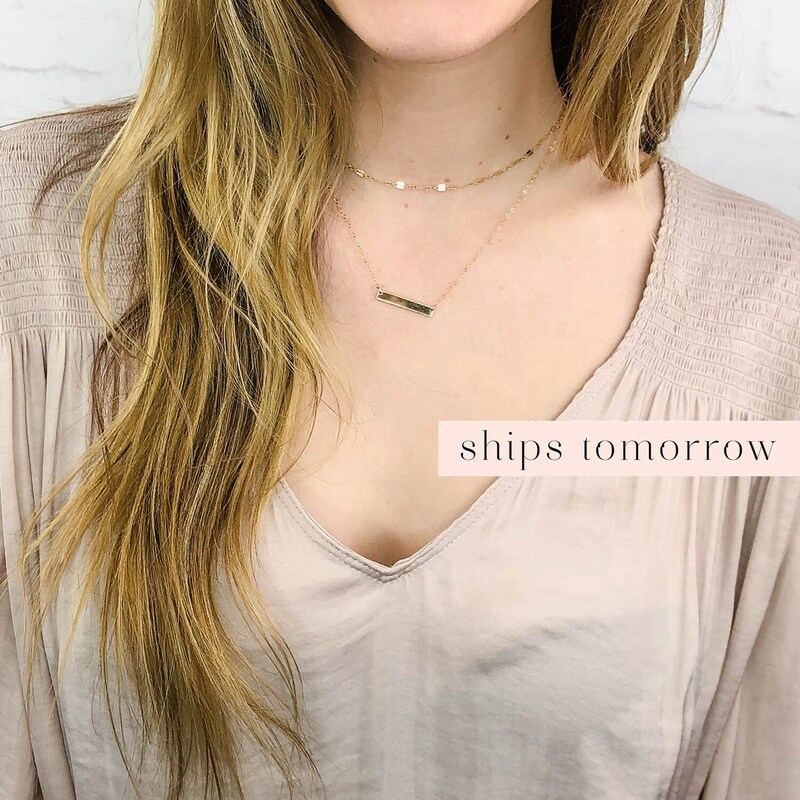 We took our best selling Lacie choker and layered it with our popular bar necklace to make create this amazing set! 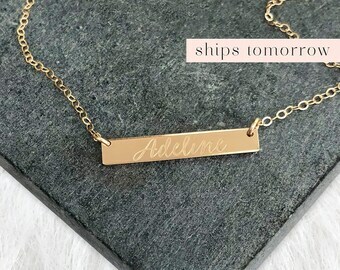 It is a completely handmade piece that is engraved with the (name, date, word) of your choice. 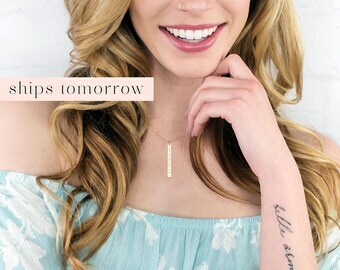 Choose from 14kt gold filled, rose gold filled or sterling silver. We do not use any plated metals. Our premium bars will not fade, chip or discolor. 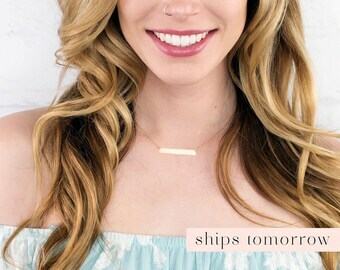 Perfect for daily wear and makes a perfect gift for brides / bridesmaids, friends or family. 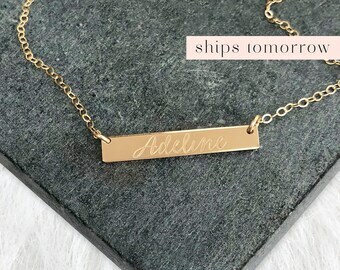 This listing is for a SET of two necklaces...our best selling llacie choker and 1 custom bar necklace! 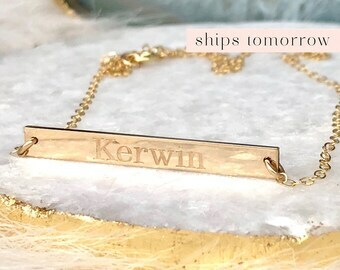 You can also select the bar necklace only. ⭐️Choose from 21 custom fonts that no-one else has! View all of the fonts in our photos. We do double sided engraving! • Or anything you can imagine! 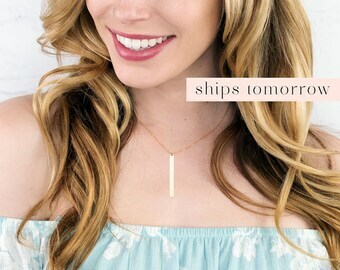 Each bar necklace starts out as a thick sheet of premium 14k gold fill or sterling silver. Our bars are made with thicker than average sheets of gold fill & sterling silver that are made here in the USA. No plated metals are used. Each Bar is cut by hand, sanded and polished in our studio. 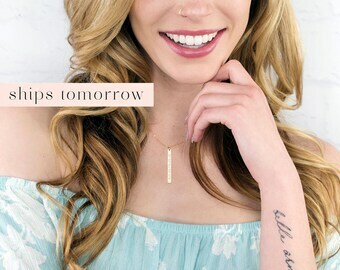 Each necklace is made one at a time to ensure amazing quality. No mass productions here. Each and every bar we make is a labor of love! After engraving your bar goes through a multi step polishing process to make sure its super shiny, with a mirror finish. If you prefer we can also give your bar a beautiful satin (brushed) finish. • Lacie chain choker made from super sparkly bar chain. • Bar, chain and components are all made using high quality 14kt gold fill, rose gold fill or sterling silver. 1) Choose your bar size, finish & length from the first drop down menu. 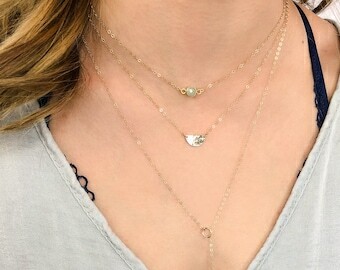 2) Choose your choker length 2nd dropdown menu. Choker finish will be in the finish selected for the bar. • What font number you would like. 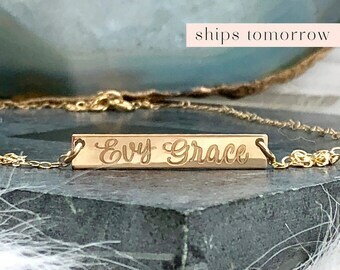 • What you would like engraved exactly as you want it to appear. (see samples below. If you have more than 15 characters message us for an upgrade to the larger bar. ⭐️ Leave an email that you check frequently so we can contact you with any questions. We have a fast production time and don't want to hold up your order. 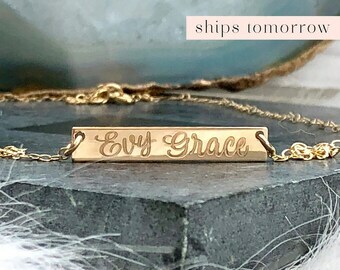 ✭We recommend this style on a large bar! You can upgrade for a small fee. Beautiful necklace. It was a gift, so I can't comment on long term quality, but the shop owner was very kind and the packaging was outstanding. It came on time and was exactly what I ordered. aesthetically pleasing but one earring broke right after putting them on. Such a beautiful piece. Shipping was quick too.